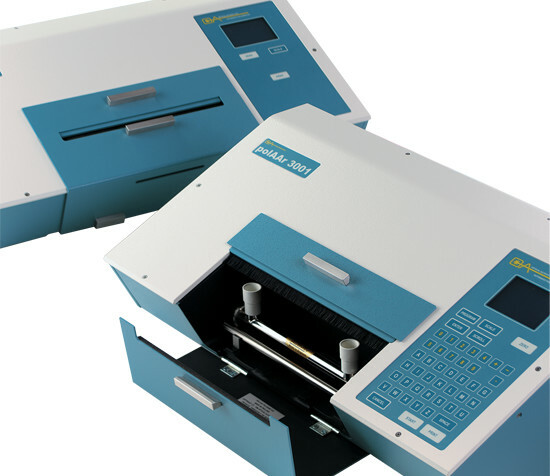 The PolAAr series of polarimeters and saccharimeters consists of eight models - with the options of single wavelength, dual wavelength or multi wavelength, a choice of two or three figure accuracy and simple or full alphanumeric keypads. Manufactured using a substantial aluminium casting and tough aluminium covers, the PolAAr series polarimeters have excellent rigidity and strength, are resistant to chemical attack and provide highly stable instruments. All versions are full circle polarimeters with a reading range of ± 90 angular degrees (in excess of ± 250 sugar degrees). A tungsten halogen lamp produces a highly stable white light source and has a typical life in excess of 2000 hours; it is inexpensive and easy to replace by the user. A very narrow band interference filter is used to select wavelength; an accurate wavelength is important, as the optical rotation of most samples is highly dependent on wavelength. The standard single 589.44nm wavelength models are suitable for measuring dark samples, absorbing up to 99.9% of the incident light, equivalent to OD 3.0, without loss of accuracy. The sample compartment is at the front of the instrument. The cover is in two sections, the front part hinges forward and down; the upper section simply lifts off. The sample compartment has been designed to allow flow tube pipes and/or thermocirculator control pipes to pass through, and is ventilated to minimise temperature rise above ambient. The PolAAr series accepts the full range of polarimeter sample tubes and cells, either jacketed or unjacketed, from 1.5mm to 8mm bore and from 5mm to 200mm path length. Within the sample compartment is a centrally located digital temperature sensor [displayed as Temp (A)]. Also, there is a socket provided for connecting a jacketed sample tube that has a built-in temperature sensor, or, for plugging in a dip-in temperature sensor when an unjacketed sample tube is being used. 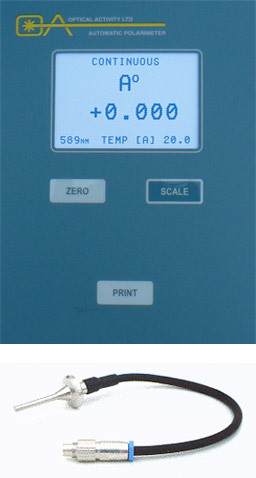 The instrument detects that a tube sensor is connected and displays the sample temperature [displayed as Temp (B)] instead of the compartment temperature provided by the internal sensor, at the lower right hand corner of the display window. The PolAAr 30 and PolAAr 3000 have a simple 3 button keypad. The difference between these two models is their accuracy. The PolAAr 30 polarimeter has an accuracy of ± 0.01 angular degrees, the PolAAr 3000 a higher accuracy of ± 0.001 angular degrees. Both instruments have a zero, scale select and print keys. 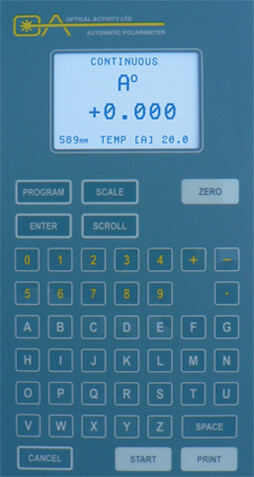 Scales available; angular degrees, sugar scale (°Z) and temperature corrected sugar scale (ISS). When a printer is connected, the time and date are printed with every reading, along with the instrument serial number, temperature and wavelength. All other PolAAr models, the PolAAr 31, 32, 35, 3001, 3002 and 3005, have a full alphanumeric keypad and are 21 CFR Part ll Compliant, providing a choice of reading mode, additional scales (specific rotation, concentration, 10 user programmable scales), user defined multiplier for different tube lengths and 6 user specified sample identifiers (such as name, batch number, lot number etc) for GLP (Good Laboratory Practice). As user specified headings, these can be in any language. The keyboard can be selectively 'locked' to prevent unauthorised or accidental interference with programmed settings. The standard wavelengths offered on the 2 wavelength PolAAr 32 or 3002 models are 589 and 546nm and on the 5 wavelength PolAAr 35 or 3005 models 589, 546, 436, 405, and 365nm. In each model, wavelength selection is by means of a simple knob on the side of the instrument. Other wavelength combinations on either the 2 or 5 wavelength models are available within the wavelength range, near UV (365nm) to near infrared (880nm). All PolAAr series instruments have a real time clock that tracks time and date. All measurements can be date and time recorded when printed out. Two RS232 serial outputs are provided for connection to a printer, computer or other ancillary equipment, together with a remote-operate/bar code port. A bar code reader can be used for sample identification and the polarimeter can initiate, or be initiated by, ancillary equipment such as an auto-sampler. All PolAAr series with full alphanumeric keypads have a data storage facility, disabled or enabled via the instruments drop down menu. When enabled this function provides storage for up to 100 measurement values for reference or exporting to a PC or printer. Optical Activity Limited is a UKAS (United Kingdom Accreditation Service) calibration laboratory, therefore all PolAAr 3 series polarimeters can be supplied, if required, with a UKAS certificate of calibration. The UKAS mark on a calibration certificate is your assurance that the laboratory issuing the certificate has been stringently assessed by independent experts to the ISO 17025 International Standard and that the measurements are traceable to National and International Standards.